A couple of weeks ago, the latest Doctor Who series started to catch fire with a great episode about dreams. 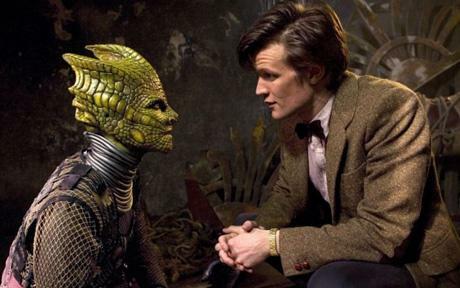 Then we have a two parter with monsters from forty years ago - Silurians, real Doctor Who monsters, creatures from way back. And this has been excellent. Well-paced, creepy, menacing, and with genuinely unexpected twists. Sure, a little celebrity casting (both in Meera Syal and Stephen Moore as the ancient Silurian leader) goes a long way, but this was glorious. Great DW (as the new moniker wants us to call it - ugh). Yep. Here's a give away. If you haven't seen it, look away now. Perhaps all will be well. Sometimes it is. But in an echo of Donna-esque proportions, the rather lovely relationship of Amy & Rory has been forgotten, thanks to the first meaningful incursion of the crack in space that first appeared at the start of the series and which seemed to have disappeared. Now we are getting it. Now it is starting to pay off. And Matt Smith's Doctor is finding himself. Chirpy but with essential melancholia, in charge and deeply insecure, bright, optimistic and filled with questions - often about himself. Yes, I am liking this more & more. This was an excellent two-parter. Full marks. It seems our new MP, Owen Smith, has wasted no time in truly becoming Kim Howells' successor and saying something he shouldn't have. The BBC website carries the story here. In short, Owen apparently described the coalition between the Conservatives and the Liberal Democrats as "a Gretna-style tryst" which he said many of his Labour colleagues could not imagine lasting very long. He added: "The Lib Dem dowry of a maybe-referendum on AV will seem neither adequate reward nor sufficient defence when the Tories confess their taste for domestic violence on our schools, hospitals and welfare provision. Surely, the Liberals will file for divorce as soon as the bruises start to show through the make-up?" It's that last phrase that has caused the fuss. The BBC report a mixture of women's groups, Welsh Conservatives and Plaid Cymru members finding his comments objectionable. OK. First - I disagree with Owen's politics. I rather hope the Coalition lasts and proves that politicians of different hues can be grown up. But second - here in Pontypridd we like our MP to be be outspoken and literate. A metaphor is a metaphor. I am quite sure that Plaid Cymru members have been saying far more colourful things about the Coalition without half the wit. Or without being able to be fully quoted on the vicar's blog. To suggest that Owen is belittling the question of domestic abuse with such words is self-serving and sanctimonious drivel of the first order. I'm not a fan of all of Owen's politics, but he is a good man who cares about people, especially those in trouble, and if we are never allowed the occasional colourful metaphor in this life we have allowed the self-appointed censors and secularist moral guardians of the age to take away more freedoms than anyone has a right to steal from us. I wouldn't edit the piece, Owen. I'd apologise for offense given unintentionally, visit a centre that helps people with abuse to highlight their plight, and if you feel that your words were right in the first place - say them again. An MPs job is to point out when people are in danger of being hurt, not to cow-tow to the politically correct. If you believe it, say it. Say it louder. Find a new metaphor and do it again. Though if it was just a cheap shot, well, we look forwards to your face on the news - but we need you there on the key days, please. With that great turn of phrase. And passion. 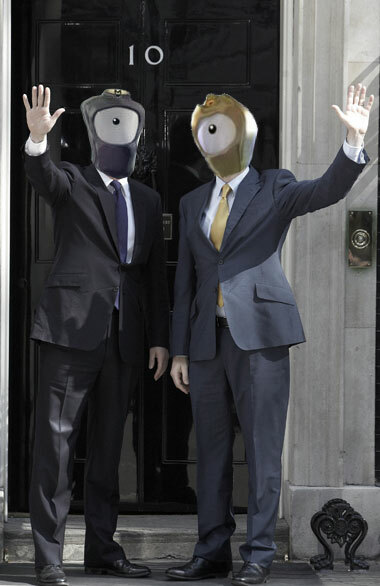 I rather like our new Olympic 2012 mascots. But they remind me of something else, don't they? And to mark the occasion, let's be frivolous. TV review time. I hope you all caught Doctor Who last night. Best episode of the new Doctor to date. I have felt throughout this series that we have been watching 55 minute episodes badly cut into 45 minute time slots. There have been clunks in plots, references to things we just haven't seen, and clearly bits missing. But last night we had a wonderful little fairy tale - the kind of sci-fi musing that only Doctor Who tells. Beautiful. Humorous, deep, touching. 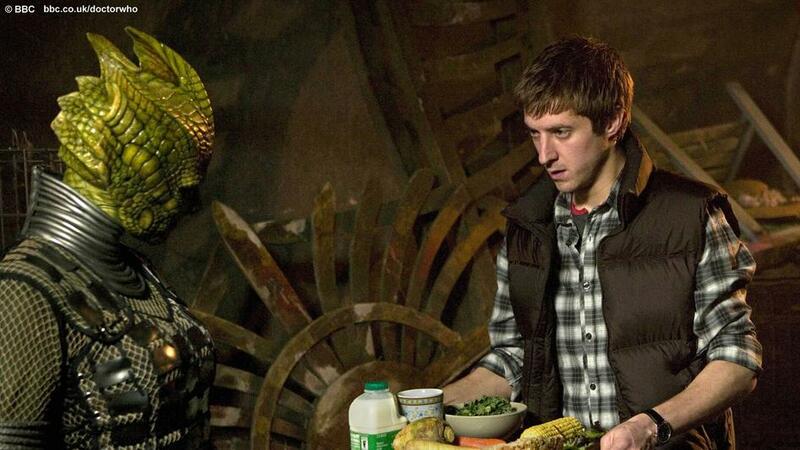 And only one moment that jarred (an alien, who was of course an old woman, called the Doctor "Doctor" though she had never met him, and no-one stopped to ask - "how did you know his name?") but we'll forgive it as the rest was so glorious. Incidentally, the other week apparently the BBC ran a trail over the end of an episode for the following programme. This garnered 5,000 complaints. Watch here for Graham Norton's rather excellent response & apology! One other thing I saw this week which I'd like to share: I have a fondness for Strictly, and do enjoy its US counterpart, Dancing With The Stars. There was a foxtrot with Nicole Scherzinger (she's the celebrity - Pussycat Dolls) and Derek Hough (the best pro on the show, who turns in outstanding choreography season after season) which simply made me smile. Watch and enjoy! On Sunday I asked if anyone was surprised how the election was playing out. Few were. "Really?" I countered. "You all thought the Liberals would end up with fewer seats?" People laughed and accepted they didn't think that. "And that the Liberals and Tories would end up in a coalition?" Again laughter, and acknowledgement that this was indeed an unlikely outcome. And, for now, again it seems an unlikely outcome. 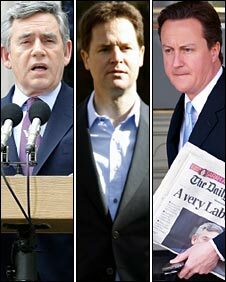 The thing about political coalitions in our nation is that they just don't work terribly well. Everyone has to be committed to them - and the only way that works is if there really is some outside force making people work together. Like Hitler - that did the trick. But little else does. And a junior coalition partner has to enter into things wholeheartedly or look like an opportunist wrecker pretty darned fast, whilst also taking the risk of being merely the majority's whipping boys. It is hardly a win-win situation. Saint Nick is beginning to lose a little of his lustre as he plays the Tories and the Labour party off each other (can you imagine the next Prime Ministerial debates - Cameron saying that whatever the result of the election, it will be the people who choose the prime minister, not Nick Clegg's demands that force his party to have a quick leadership election...) and meanwhile we have an economy clearly run by the City with very little reference to whoever is or isn't "in power". I repeatedly say I don't have a political allegiance. But I do think we will see another General Election, and the way things are panning out, I think we'll see it sooner rather than later. And I wouldn't think it would make too much difference if the Coalition of the Defeated assume office, the Rainbow Alliance (every colour except Brown), or a Tory minority government now. Goodness. We might all be in for a surprise! So a Con-Lib coalition after all. You know, I think this may well all end in tears, but I pray they are tears of joy - that people learn to work together for the common good, and in doing so realise that it is good to do so. I have my doubts - and seriously hope to be proved completely wrong. This is no time for cynicism, but for all of us to pray for blessing and guidance and for more surprises - in a world where economies can destroy people, we need to see that governments can also turn the world around and make life better. Whether or not the government we find we have is the one we would have chosen. What an election. With the exact nature of our new government not yet revealed to us, I still had the chance to congratulate Pontypridd's new MP this afternoon. I said I had two friends standing at this election. Mike Powell, for the Liberal Democrats, achieved what must be a record high vote for his party in this constituency, and must be congratulated for it. He worked hard, and though he must feel diappointed, I am amazed that in an area with the political complexion of Pontypridd he did so well. It is a testimony to him. Owen Smith won, and he and Liz dropped in today. I am delighted for them. They are wonderful, wonderful people, and in Owen we will have a super MP. I refuse to have any party allegiance, but I will ally myself with good people of any colour, and Owen is such a man. One of the things about being in a community for any period of time, and it's drawing close to ten years I've been here, is that you see the best and the worst of people, and you get to give and to receive. Mike & Owen both have been people from whom I have received much friendship, and I hope have received something from me too. Owen & Liz used to be my neighbours here. And in my early days at St Catherine's, when I was new and knew no-one, and the church was quite different and much of what we have and do now was simply an intention and a prayer, I'd roll up to Owen & Liz's late in the evening and drink a glass of red or cadge food off their kitchen table (always excellent) and their hospitality helped me through more than they know. And I learned then that Owen always wanted this job, serving our community as MP. Not many of us get our dream jobs. I suspect it's quite the responsibility when things work out and we find ourselves standing with reality and our dreams colliding. So I pray that Owen will always be able to be as good as his intentions and his word, and help many, many folk here through the good, the bad & the indifferent that life throws at them, all the things which an MP has a chance to speak to and to influence, and that after a strongly fought campaign his natural joy would remain and become a real energy for all the people of this place that is our home. And we pray too for the national result: I am still amazed by snippy party political comments from clergy on facebook! We have a choice: call people names, or pray that good is done. Negative or positive. Death or life. You choose. I am amazed by the stupidity and pastoral short-sightedness of some of my fellow clergy. Facebook is full of vicars telling people to Vote Labour, to remember how awful the Tories are, to realise that Clegg offers the only way forwards, to understand that Cameron has the only answers to Broken Britain. Guys - if you want to be politicians, get a new job. If you want to have the right to tell everyone about Jesus, then don't alienate the majority of your flock with your party allegiance during an election. Yes, it's amazing, but Jesus doesn't belong to one party. There is good across the board. Even in some of the extreme groups, I daresay, though I haven't looked long and hard. And when clergy get all hot and bothered and too closely alligned to one party (especially in the rather heated moments of the final stretch of an election) all it does is show everyone that they are about as much to be believed generally as the politicians they suddenly champion (and about as much to be trusted as the other politicians they are so roundly denouncing - after all, "do unto others as you would have them do unto you" is a line that works well any time). In congregations, people think differently to each other. The vicar telling them all to "vote Labour" (or any other way) is offensive. Anti-democratic. It is spiritual bullying, because it is a pretence of God telling them to do it - "I'm the spiritual authority here, and I say this!" 1. Vote every time. People have died that we can do this - we should cherish the chance. 2. Vote after thinking about what matters to you, and how you think the candidates have addressed these issues. 4. Vote secretly. It's your vote. Let no-one pressure you into voting like they did. So - if you are one of my clergy friends and have transgressed, beg your congregation's forgiveness and don't do it again. You have just lost the right to tell many of them about Jesus. You have just lost the trust of many of them. But asking forgiveness is a start in gaining back what you ought to have. Sure - we should be passionate about issues and justice and compassion and the needy: but people are never our enemy. People are people. God so loved the world he gave his only Son that whoever believes in him might have eternal life. Elections are no excuse to forget this and indulge in name calling and faction. Unless of course - it's not a case of forgetting, more a case of revealing what's going on the whole time. David S likes Desmond Tutu and Physiotherapy. Together? I didn't know the Archbishop offered this service. You can never make enough particle effects, can you? But at least he'd changed the toilet syphon first. The varied lives of clergy are put under the spotlight. My: PRAISE GOD for Llandaff Diocese putting a jacuzzi in the vicarage. The very definition of good clean fun... Now: chicken tikka massala here I come! I guess he wins on holiness points. Near Manchester airport watching lots of gadgets that fly - brilliant! It's the little things, as St David would say.